I don't know if this is true for everyone but it seems to be true for me every year. After I get my house decorated for Christmas, and I think I'm ALL done, I tweak a few things here and there just for fun. There's no pressure to get anything done, just having fun with it. That's what I'm doing now. Of course, what I most look forward to is the baking of cookies, wrapping the gifts and setting them out (watching my son guess what each one is) and watching Christmas movies. I've been lucky this year to have my husband do most of the Christmas shopping because we have boys. He is in his element shopping for "guy stuff" in the electronics department and other places. I will shop for everyone else. Now on with some tweaking I've been doing. I remembered that I have some little trees down in my basement that usually go out on my front porch every year. I didn't use them this year, so I decided to bring one inside and place it in my kitchen. I placed it inside a vintage olive bucket and draped a simple kitchen towel out of it (for the red stripe of course). Look. It lights up too. Also, I felt like my hallway leading down toward the kitchen could use a little something, so I hung some red ball ornaments off my plate rack (and even the antlers). Red is such a cheerful color and just feels right at Christmas. I recently purchased this cute Christmas table runner from H&M too. I'm using it over my oven handle though. So, now when I walk into the kitchen, I'm greeted with just a little more cheer. Here's to tweaking at the holidays! Your kitchen is so pretty! I love your little tree, very festive! 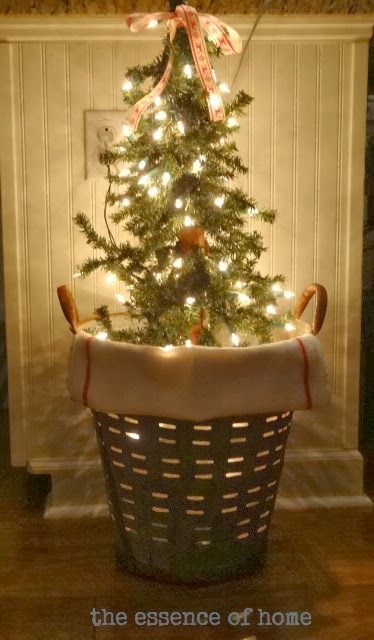 Love that olive bucket with the tree...so sweet! I love the little tree in the bucket. love all the touches of red. It just brings a house to life for Christmas!! I do the same thing - tweaking things! It is such a good feeling to have it DONE and just enjoy tinkering with things! As always, I love seeing your home! Yes, things get tweaked here and there. I love your new additions. It looks so cute and cheerful in the kitchen. I love that you used red touches everywhere. It is all so pretty. Kelly you have an elegant kitchen, adore your black and white. When we retired we went from a large old house (Parsonage next to the Church) to our little cottage. But my kitchen tiny as it is, is in white and black knobs, and I've used several of your ideas, and I love my Christmas Kitchen. I think I'll post it tomorrow. Thanks for all your ideas. The tree in the bucket is the frosting on the cake. 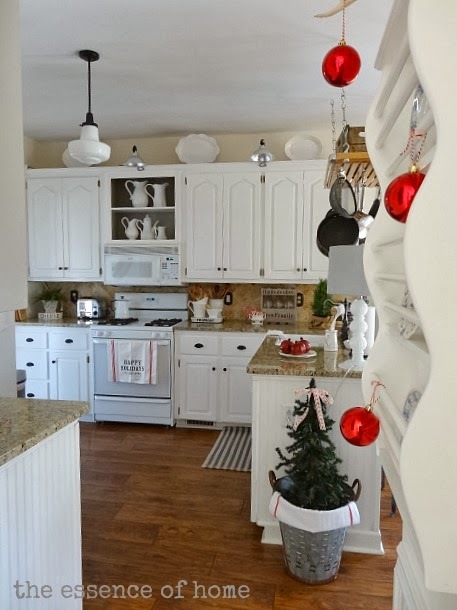 I think I just fell in love with your kitchen and the holiday decor you have decorated with. Adore that olive bucket and the tree all lit up. So Lovely! Adorable!!! and the red ball off the antler is my favorite! is there anything that doesn't look good in an olive bucket? they are the best!! Love the lighted tree in the olive bucket. Love the tree too in the olive bucket, everything looks wonderful kelly. The red just does something doesn't it? That's way I wanted to bring it into my decorating this year. Love the outside of your house too. love how you decorated the benches with throws and pillows. I know I tell you this all the time...but I adore your kitchen! It looks nice and big too. I usually keep tweaking up until the 24th. LOL! I just decided the other day that I MUST have a hot cocoa station, so I'm now working on that. :) I love your little tree in the olive bucket and the festive touches of red are so pretty. I love the pops of red too! Looks great! I've been tweaking all week too lol! Love the lights on that tree! Looking quite festive over there, ma'am! Happy holidays to you!! Love your touches of red! The balls are a fun detail. 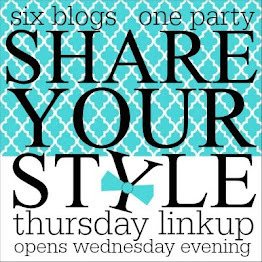 Love your sweet tweak! The little tree is adorable in the olive basket all lit up. Love your holiday home! Love the pops of red. I put some red Christmas touches in my kitchen this year too. Love the tree in your kitchen too. Everything looks great! You tweaked it to perfection! 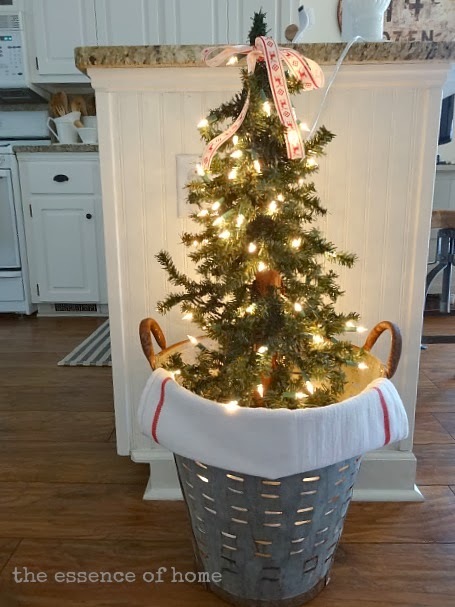 The little tree is cute, but putting it in the bucket with the towel is so cute. The red balls add just the right amount of cheer. I've got more than one area that needs some tweaking and today I shall wrap. Like maybe find a bin or basket with holes in it so I can lay some lights at the bottom, that looks awesome. 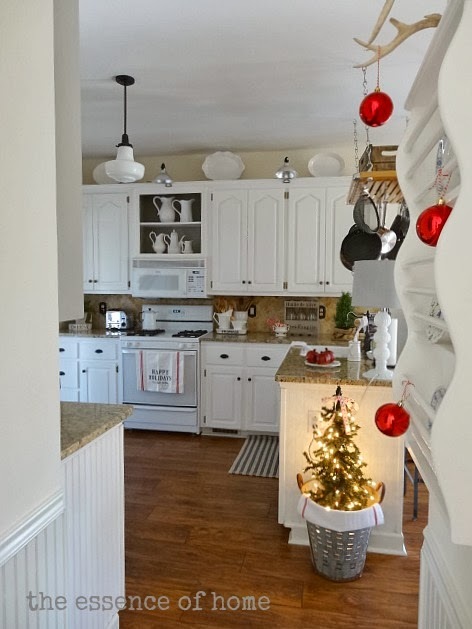 Your kitchen looks very festive Kelly..Love the little tree in the bucket..
Love your new "tweaks"…you are always creating Kelly!…Have a great weekend! I love the red and a tree with white fairy lights is perfect in any room. Love the table runner/towel, too! oh, oh oh!! JUst LOVE all of these touches--Yup so cute! I never have heard of an olive bucket---I assume it has something to do with olives--where did you get that?? Cool--I love the look . I love the towel and the plate rack......HEY, you must get tired of people saying, "I LOVE this and that" , but I DO! 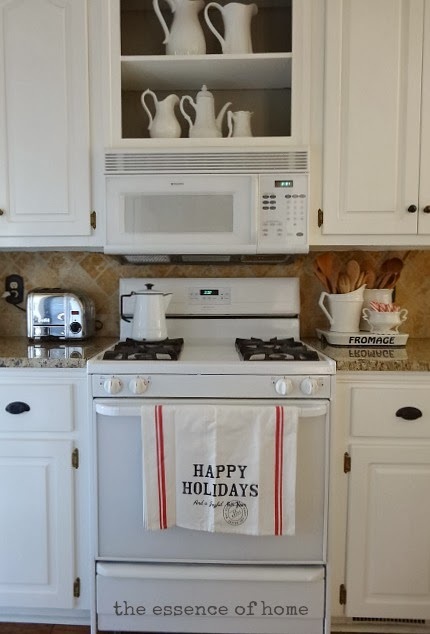 I LOVE that table runner, and I absolutely adore your kitchen! It is so cozy. Kelly, Your kitchen is really pretty decorated for Christmas! I also love the Fromage tray. Merry Christmas to you and your family. Everything looks amazing! Funny I am so ready to take things down and switch things up...two more weeks. They Can Stop Growing Now!